September is National Food Safety Education Month (NFSM). 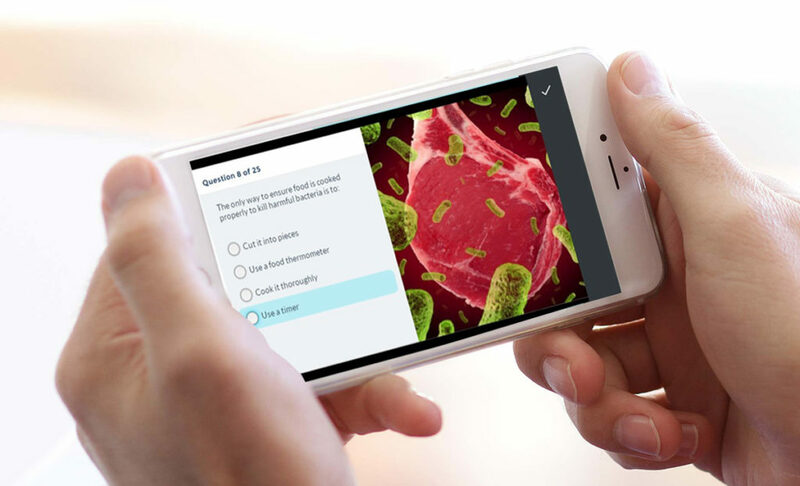 It is a great time to heighten your knowledge about food safety and causes of foodborne illnesses. Join the conversation on social media by using #NFSM. The Center for Disease Control (CDC) estimates that because of foodborne illness 76 million people fall ill, 325,000 are hospitalized and 5,000 Americans die annually. Foodborne illness also cause billions of dollars in healthcare-related and industry costs annually. Consumers directly affect the safety of foods through their food handling and preparation practices. Several national and international reports have noted that poor hygienic practices in the home are responsible for between 30-40% of food-borne illness. It is thus important that everyone be consistent in practicing safe food principles and handling procedures to prevent incidents of foodborne illness – and education is key. Foodborne illness can also be transferred from one host to another by foods, contaminated surfaces or the vomit or feces of an infected person. Viruses are difficult to kill, as they are resistant to heat and cold. 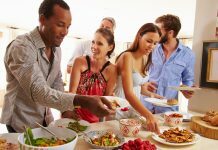 According to the Centers for Disease Control and Prevention (CDC), about 20 million people get sick each year from norovirus, making it one of the leading causes of foodborne illness. Campylobacter 2 to 5 days Meat and poultry. Contamination occurs during processing if animal feces contact meat surfaces. Other sources include unpasteurized milk and contaminated water. Clostridium botulinum 12 to 72 hours Home-canned foods with low acidity, improperly canned commercial foods, smoked or salted fish, potatoes baked in aluminum foil, and other foods kept at warm temperatures for too long. Clostridium perfringens 8 to 16 hours Meats, stews and gravies. Commonly spread when serving dishes don’t keep food hot enough or food is chilled too slowly. Escherichia coli (E. coli) O157:H7 1 to 8 days Beef contaminated with feces during slaughter. Spread mainly by undercooked ground beef. Other sources include unpasteurized milk and apple cider, alfalfa sprouts, and contaminated water. Giardia lamblia 1 to 2 weeks Raw, ready-to-eat produce and contaminated water. Can be spread by an infected food handler. Hepatitis A 28 days Raw, ready-to-eat produce and shellfish from contaminated water. Can be spread by an infected food handler. Listeria 9 to 48 hours Hot dogs, luncheon meats, unpasteurized milk and cheeses, and unwashed raw produce. Can be spread through contaminated soil and water. Noroviruses (Norwalk-like viruses) 12 to 48 hours Raw, ready-to-eat produce and shellfish from contaminated water. Can be spread by an infected food handler. Rotavirus 1 to 3 days Raw, ready-to-eat produce. Can be spread by an infected food handler. Salmonella 1 to 3 days Raw or contaminated meat, poultry, milk, or egg yolks. Survives inadequate cooking. Can be spread by knives, cutting surfaces or an infected food handler. 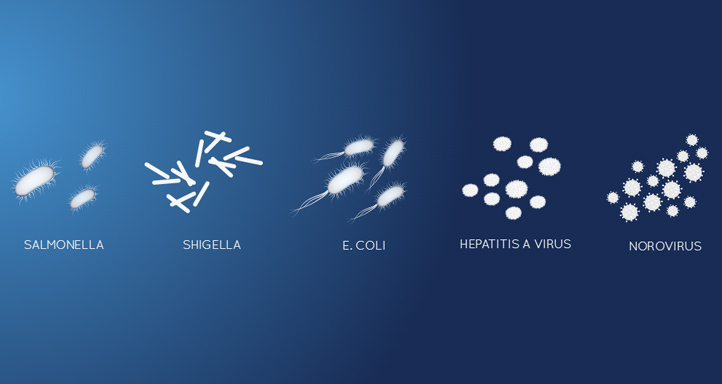 Shigella 24 to 48 hours Seafood and raw, ready-to-eat produce. Can be spread by an infected food handler. Staphylococcus aureus 1 to 6 hours Meats and prepared salads, cream sauces, and cream-filled pastries. Can be spread by hand contact, coughing and sneezing. Vibrio vulnificus 1 to 7 days Raw oysters and raw or undercooked mussels, clams, and whole scallops. Can be spread through contaminated seawater. If you’re part of what is called an “at-risk” or “vulnerable” population, a foodborne illness can be extremely dangerous. What makes these populations more at risk? In many cases, the problem lies with the immune system. The immune system is the body’s natural defense system against “foreign invasion” by pathogens (bacteria or viruses that can cause disease). In healthy people, a properly functioning immune system usually fights off harmful pathogens readily. Signs and symptoms may start within hours after eating the contaminated food, or they may begin days or even weeks later. 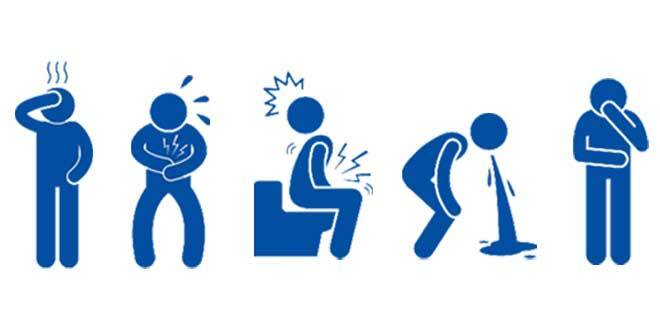 Sickness caused by food poisoning generally lasts from a few hours to several days. If symptoms persists, a person should see medical attention. Do you know what food poisoning is? Interested in learning more about the latest in food safety best practices? Attribution of Foodborne Illness, 1998-2008 – study provides a comprehensive set of estimates available to answer the question: which foods make us ill?